One of Nationalist Ireland’s most unique emotional treasures has been found, but as yet has not been seen by those who revere it most. The ironic part of the story is that many people never knew it was missing, and here’s why. Joseph Mary Plunkett was one of the most beloved and charismatic of all the leaders of the 1916 Easter Rising. A deeply religious individual, as evidenced by his middle name in honor of the Mother of God, he came from the same family that had given St. Oliver Plunkett as a martyr to the Church. A youth of frail health, he grew into a sickly manhood, though his heart was one of the strongest when it came to love of Mother Ireland. Always creative and bright, the nationalism he inherited emerged in inspired poetry in which he damned the conquerors of his land and praised the glories of her heritage. His most memorable work remains the immortal verse, I See His Blood Upon the Rose, in which he sees the likeness of Christ in all His creations. It is little wonder that he attracted other talented individuals into his world – one of whom was the beautiful young Grace Gifford whose artistic ability and nationalist fervor complimented his own. After his death, Grace Gifford threw herself into the Republican activities of Cumann na mBan – Ladies Auxiliary to the IRA – and was herself jailed in the women’s section of the same Kilmainham jail in which her husband had been executed. Like Joseph before her, she left an artistic memento on the stone wall of her dreary cell – it was a sketch of Mary, the mother of God, perhaps in remembrance of Joseph’s middle name. Admired by all the women prisoners, it was dubbed the Kilmainham Madonna. In May 1923, Republican prisoners were removed from Kilmainham. The women were transferred to the North Dublin Union, the old jail was closed and the only remaining captives were bitter memories and scattered etchings on cold stone walls. The Jail remained abandoned until 1960, when a group of 1916-1923 veterans, volunteered to restore it as a national museum. Over the next 20 years, they worked at the restoration. Some things however, could not be restored. Sadly, one was the Kilmainham Madonna which had fallen victim to the elements, as rain, wind, and snow ravaged the old cell wall through broken windows and a collapsed roof. The story of the Madonna was well known however, insuring that it would be sought by future visitors, but how could it be restored if no one knew what it looked like? Sadly, Grace had passed away on December 13th 1955 and couldn’t guide them. Then, an embroidery done by Grace Gifford was found; it was the Madonna in an oval of stars, and it was beautiful. The piece was painstakingly reproduced, in every detail, on a cell wall in the ground floor museum area. The Kilmainham Madonna had been restored – or had it? In 1986, the State took over the upkeep of the Jail, and they sponsored exhibits relating to its history. One of those exhibits led to a remarkable discovery. A 1988 article that I had written in the Irish Echo newspaper eulogized Bridie Halpin, a Dublin lady who, in her youth, had been incarcerated in Kilmainham for Republican activities. She left a remarkable collection of personal memorabilia of great historic significance. At my suggestion, the Halpin family donated Bridie’s mementoes to Kilmainham. That prompted a search for former Cumann na mBan members or their descendants, willing to share other souvenirs and artifacts, with the intent of building an exhibit to honor the Republican Women of Ireland. People responded generously, and in 1997, Kilmainham Jail opened an exhibition entitled Guns and Chiffon which Irish President Mary Robinson called long overdue. The exhibit led to a book on the subject, and eventually traveled to several venues in America. There was one thing missing however, and that was any discussion of the Madonna. The reason was that during the search for artifacts, one lady offered a sketch of the Kilmainham Madonna which didn’t match the one that restorers had re-painted on the first floor cell wall! Further, Grace’s name and address were in the lower right corner of the sketch! Where had it come from? The lady claimed that her great aunt – to whom the drawing was given – was Grace’s cell mate, and received it as a gift from her in 1923. The donor said that when it was learned that the women prisoners were to be transferred from Kilmainham, her relation told Grace that her only regret would be leaving the beautiful Madonna behind, for she had gotten so used to its comforting presence. Grace consoled her cell-mate by sketching a copy of the Kilmainham Madonna to take with her wherever she went. This was the sketch now offered. Museum officials were understandably perplexed. How could they tell the public that they had been viewing the wrong version of the Madonna all this time? But it was not a deception, for the version they reproduced was a sincere effort to recreate that historic artifact. In truth, it was only through the Museum’s continuing efforts that the true Madonna was finally found. Because of my close involvement with the project, I received a copy of the sketch, and asked Mr Pat Cooke, museum curator, for permission to publish it. When all is said and done, history must be served, and I thank Mr. Cooke for allowing this story, and the picture of the true Madonna to be published. How will the issue of the two Madonnas be resolved? We don’t know, but since both are beautiful and both were done by the same remarkable lady, both deserve to be seen. Perhaps one can remain on display in the main hall, while the other is reproduced in the restored cell where Grace was actually held, when that section of the Jail is fully restored. It might even inspire some to contribute to the restoration, so that the true Kilmainham Madonna can go home. 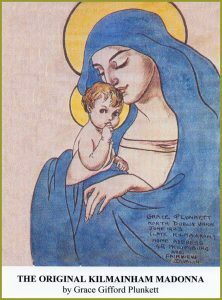 The image reproduced here is the true Kilmainham Madonna.